Congratulations to Dantzelle for winning this giveaway! This post is brought to you by The Home Scoop. All listings from all agents, all in one website, all for free! We’re so excited for for today’s Dream Bathroom giveaway! 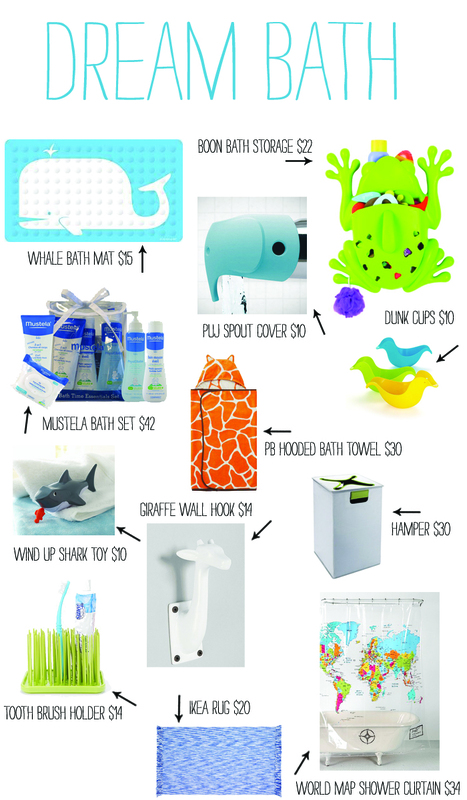 Everything you’ll need to deck out your kiddos bathroom valued at $250, but free of course to our lucky winner. We have the link list and details why these items make the cut, after the jump! More about our awesome sponsor: The Home Scoop is a local website that brings together listings from all agents to one site. Browse to find your dream home, search with specifics like what elementary school you’d like your kids to attend, search by newest listings, and lowered asking prices, evaulate your current home’s worth and so much more! This site is so amazing, if you’re looking to buy or rent in Utah, you’ll be so glad you check out The Home Scoop! 2. Follow The Home Scoop on Facebook. 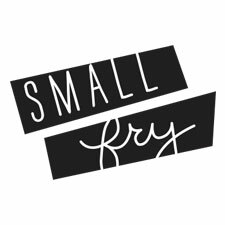 Follow Small Fry on Facebook, Instagram, Twitter, or Pinterest. Leave separate entries for each. The winner will be announced and notified Sunday May 26th, good luck! Keep reading for this giveaway’s “Where to Buy” link list! 1 // A no-slip Whale Bath Mat 2 // Boon Froggy Scoop Toy Holder for quick bath time clean up. 3 // Puj Elephant Spout Cover to protect those slippery heads. 4 // Mustela Bath Time Essential Set, smells absolutely amazing! 5 // Pottery Barn Kids’ gorgeous jacquard animal bath towel. 6 // Dunk Cups perfect for pouring. 7 // A wind-up shark toy. 8 // A darling giraffe hook to hold your towels. 9 // Our favorite hamper! Cool design that hides the appearance of the never ending laundry! 10 // We love this grassy organizer for the bathroom. Let your toothbrush drip dry without messing up with countertop! 11 // Ikea’s flat woven rug that is reversible, so you get double the wear! 12 // We love this world map shower curtain. Educational and colorful! shared it on facebook! amazing! follow the home scoop and small fry on facebook! pick me! Shared on my FB page and liked Home Scoop on FB! I actually need almost all of these items! Would love to win! I’ve shared this on fb. I follow SmallFry on twitter. I follow SmallFry on Pinterest. Shared on Facebook, and liked home scoop too! shared it. and liked it. Following Small Fry on Facebook and Home Scoop on Facebook. And I follow Small Fry on instagram! liked home scoop on fb. Follow Home Scoop on FB! shared on FB! would love all this for my little man! following the home scoop on FB! I have done 1 and 2! Wish me luck! I shared the contest on Facebook and I’m following The Home Scoop! Scoop followed & post shared! I’m following Small Fry on Facebook! I shared on facebook and followed smallfry on fb and instagram. and the home scoop on Facebook. My due date is this Friday and that’s all I have left to finish is his bathroom. I hope I win!!! I shared on Facebook and followed the home scoop! shared it on face book. Thanks for the chance! I follow you on IG. Thanks for the chance! I follow you on pinterest! Thanks for the chance! I am now a follower of “The Home Scoop” and shared the post on my Facebook. Thank you for the opportunity to win this wonderful package. Followed “Small Fry” on Facebook. I Follow The Home Scoop on Facebook. Followed “Small Fry” on Pinterest. I follow Small Fry on Facebook and Pinterest!! I follow the home scoop on Facebook! Following you on facebook! Due July 7th. SO in love with this givaway!!! I “liked ” small fry on FB. I follow small fry on pinterest, FB and twitter. I shared on my fb wall and I liked the home scoop on fb! And just ‘liked’ the home scoop! I follow home scoop on facebook. The dream bathroom would be amazing for my 3 little ones! Follow The home scoop on facebook! Follow small fry on facebook! Follow small fry on pinterest! I folloed the home scoop on facebook! Shared this post on Facebook! Pick me!! Follow Home Scoop on Facebook! Already follow Small Fry on Facebook and Instagram, now on Pinterest too!!! Pick me!!! Followed Small Fry on Facebook and pinterest and already follow Small Fry on Instagram. I hope I win! I shared on Facebook & liked The Home Scoop on Facebook. Liked on Facebook ! Amazing giveaway. Fingers crossed to win :)! Following you guys on FB and The home scoop too! Shared on my fb group page! Liked The Home Scoop! Great giveaway! I follow on Instagram under blairgwin! shared link on facebook! boo yah! I shared and liked FB. I “liked” The Home Scoop on FB. I started following you on Twitter! I started following you on Pinterest! THX! i shared and liked 🙂 Thanks for the cool giveaway! We love bathtime!! This really is a dream! Liked The Home Scoop on Facebook, like Small Fry Blog on Facebook, Instagram, and Pinterest, and shared the picture on Facebook! I liked The Home Scoop on Facebook. Thought I would give this a whirl! I know two little boys who would absolutely love these items! I follow The Home Scoop on FB! I shared – sent messages to friends too! Following Scoop on FB! What a fantastic round up of things! Splish splash! Love this giveaway! Shared on FB and following The Home Scoop on FB! Following Small Fry on IG! I liked you on facebook! Love this giveaway! shared & liked the home scoop on fb! I follow the home scoop on Facebook! And of course I’ll share it. Wow, what an amazing giveaway! I follow on fb! Shared on Facebook; best giveaway! And I follow you on Instagram 🙂 Thanks so much for this! I “liked” and “shared” the post on my facebook wall. I “liked” The Home Scoop on facebook too! Shared on Facebook and following the Home Scoop! Following Small Fry on Instagram too! I follow Small Fry on FB, Pinterest and Instagram. I shared the giveaway on FB and follow The Home Scoop on FB. I now follow Home Scoop on FB! Shared and I like The Home Scoop on FB. i follow small fry on IG and i love them! followed the home scoop on fb, too! I follow/like The Home Scoop on Facebook and I shared this giveaway link on my Facebook wall! just created a pinterest to follow you guys! already am feeling so inspired by all your boards. I follow Small Fry on Instagram! Pick me!!! I like Home Scoop on Facebook! I follow Small Fry on Pinterest. You guys are awesome! and lastly, but not least, I shared this on my fb wall. I better win bc I feel like a crazy for commenting this much on one post! Thanks SF ladies! Shared giveaway on FB and liked home scoop on FB! Amazing giveaway!!! Shared the giveaway on Facebook and liked The Home Scoop on fb!!! Woooohoooo!! Gosh your giveaways are unreal!! I liked the site on Facebook and I did a shout out on Instagram! Fingers crossed! I shared it on FB and I “liked” The Home Scoop! Such a great giveaway!! I “like” smallfry on facebook! Following the home scoop on Facebook. Follow small fry on Pinterest. Like small fry on Facebook. Andddd I already follow you on twitter too :)! I shared on Facebook and follow the home scoop on Facebook. Follow on Pinterest and love your pins! I liked small fry on fb! Shared giveaway on FB – this would be such an amazing gift for my Blaze! We have almost NO bath stuff for him. I follow on Facebook! Love Small Fry! Shared on Facebook and following! Following Home Scoop on FB, and shared! Thanks for the chance! Liked Small Fry on FB!! And following via Pinterest as well! FB shared this. Love this giveaway! FB shared and following Home Scoop on FB! This looks amazing! Shared on Facebook, followed Small Fry and the Home Scoop! 🙂 is be so happy if I won this!!! This would be awesome for baby #2 due soon! I shared the dream bath giveaway information post on Facebook. I also follow The Home Scoop on Facebook. Shared your post on Facebook, also like Small Fry on Facebook. Pick me! Shared on FB and liked! Step one complete! followed home scoop on facebook! follow you on instagram- looooove! follow your pinterest boards- so many cute ideas! I shared the post on Facebook and followed The Home Scoop!